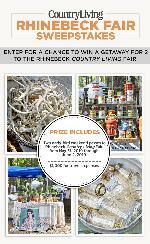 Prize: $1,000 in Cash + 2 admission tickets to the Rhinebeck Country Living Fair in Rhinebeck, NY from May 31, 2019 through June 2, 2019 ($1,080). Statistics: This contest was opened by 71 and entered by 6 ContestChest.com members. 8% of those who opened the contest, entered it.